The Paterson Review of International Affairs is issuing a call for papers for its 14th Volume. The submission deadline is now September 31, 2013. The Paterson Review of International Affairs is a scholarly journal exclusively showcasing the work of graduate students in the field of international affairs. Managed by students from the Norman Paterson School of International Affairs, the Paterson Review is dedicated to publishing exceptional articles on a wide range of emerging issues in the theory and practice of international affairs. Please see the attached poster for specific details, guidelines, and criteria. Submissions may be sent to patersonreview@gmail.com. We invite you to submit your papers for the opportunity to be published in the 14th volume of the Paterson Review. 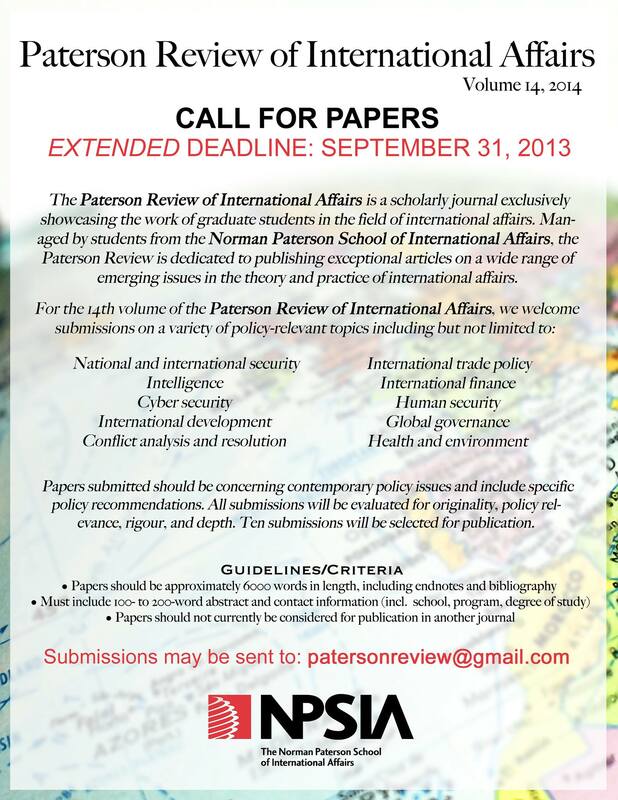 The Paterson Review of International Affairs is issuing a call for papers for its 14th Volume. The submission deadline is July 31, 2013. Canadian Foreign Policy Journal in Partnership with Fulbright Canada is pleased to announce a call for papers requesting submissions on the topic of sub national influences on foreign policy in the Canada-US context. Whether it is issues related to the environment, the far North, energy trade or security, sub-national processes, actors and interests are becoming increasingly important influences in shaping and defining Canada-US relations. Whereas the Canada and US politics of the past was largely the purview of states, now the politics of globalization and power diffusion highlight equally important influences such as the foreign policy and lobbying activities of Quebec and Alberta in Washington, emerging relations between provinces and states, and municipalities, the evolving roles of provinces and states in bilateral relations. Sub-national influences have now become a new front line in strengthening Canada-US relations, creating challenges and opportunities brought on by new trends and developments in how foreign policy is influenced and made. The challenges mostly take the shape of the range of different actors and their impact on foreign policy outcomes. The opportunities are driven by increasingly confident parastatal, regional, local and provincial actors who shape these policies. Examples include the Keystone Pipeline, freshwater sharing, border security, Hydro Quebec, ideological organisations and the influence of NAFTA on sub national relations. Canadian Foreign Policy Journal (CFPJ) publishes thematic issues regularly. The theme may be approached from a particular or, preferably, interdisciplinary social science perspective. Issues normally consist of an introductory review article (approximately 5-7,000 words) and 5-7 articles (approximately 6,000-8,000 words). Each issue is normally overseen by a special guest editor. The title of the thematic issue and the name of the guest editor(s) are printed on the front cover. All papers in each of the thematic issues are subject to peer review and benefit from comments and editorial guidance from the guest editor and the CFPJ editor. trends in health, the environment, and the new diplomacy. Over the next several years we will examine linkages both internal, such as domestic and provincial politics, and external, including Canada’s relationship with multilateral and regional organizations. The varied sources of policy including domestic politics, paradiplomacy and diasporas are also considered. Contributions are drawn from Canada and around the world. Essays are fully referenced, peer-reviewed, authoritative yet written for the specialist and non-specialist alike. Our readers include government officials, academics, students of international affairs, journalists, NGOs, and the private sector. The Seven Year Itch: Canadian Foreign Policy Under the Harper Government, Looking Forward, Turning Back? A lot has been written recently about the elemental changes the current government is taking in regards to transforming Canada’s approach to development, defence and diplomacy. The decision to fold CIDA into DFAIT, the establishment of an Office of Religious Freedom, the failure to secure a seat on the UN Security Council as well controversies surrounding the purchase of the F35 stand out as examples of these changes. In terms of environmental policy and international law, the recent move to quietly pull out of the UN Convention to Combat Desertification, making Canada the only country in the world to do so, mirrors the government’s 2011 decision to formally withdraw from the Kyoto protocol. At the same time the government has been persistent in its pursuit of free trade agreements, achieving success both bilaterally and regionally. To what extent are these and other changes fundamental shifts in Canadian foreign policy? Are they more than just rebranding? What are the implications for Canada’s standing and its status as a Middle Power? Is multilateralism still the reference point for understanding Canada’s engagement in the world? The Norman Paterson School of International Affairs’ Student Association (NPSIA SA) invites the submission of abstracts for its inaugural Graduate Student Conference entitled “Asia in International Affairs”. As the world approaches what some label the “Asian Century”, it is no surprise that scholars, policy-makers and politicians are rapidly shifting their focus towards the continent. In line with this, we are inviting submissions from interested graduate students in international affairs, political science, public policy and other relevant disciplines. Papers presented at the conference are also invited to be included in a subsequent publication of the conference proceedings. Possible topics may include, but are not limited to, the following: the rising relevance of India and China, the politics of demographics, human rights, ASEAN, environmental security, ethnic cooperation/conflict and economic integration. Please submit your abstract (no longer than 300 words) in PDF form along with your name, institution, and department to npsiastudentconference@gmail.com by March 5th 2013. Those selected will be contacted by March 12th 2013.